Custom elevated and non-elevated bleachers are designed per your specifications. You make the option selections and our engineers will design a bleacher set specifically for you. Non-elevated Bleachers - Characterized by the ability to walk from the first row onto the field non-elevated bleachers are fixtures in high schools throughout the United States. 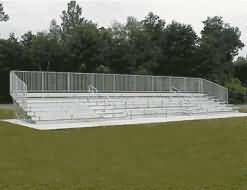 We can design non-elevated bleachers up to 20 rows high and just about any length for your organization . We can provide the materials only so you can build them yourself or we can provide factory trained assembly service for larger projects just about anywhere within the lower 48 US states. Click Here For Details. Elevated Bleachers - Characterized by having first row spectators feet rest on a raised platform (typically about 36" above the ground). 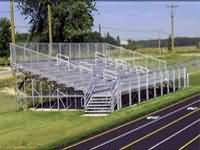 Elevated bleachers are generally used in places that have an obstruction between the spectator and the playing feild, a fence for example that sits 4 or 5 feet tall that is 10-15 feet in front of the bleachers on a football field. Elevated bleachers would enable those in the first row to see above the fence and have a clear line of sight. We can design elevated bleachers up to 20 rows high and just about any length you wish. We can provide the materials only so you can build them yourself or we can provide factory trained assembly service for larger projects just about anywhere within the lower 48 US states. Click Here For Details.